A scene from an animated film shown to visitors at the new Acropolis Museum that depicts Christian priests destroying parts of the Parthenon has been deleted following protests by the Greek Orthodox Church. The priests used to destroy ancient temples. Now they want to remove scenes from a film, Costa-Gavras told Greece's Mega TV channel: This is the kind (of censorship) that used to happen in the former Soviet Union. 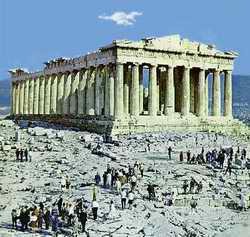 Costa-Gavras' 1-minute, 40-second segment depicting the damage done to Parthenon over the centuries — from marauding Germanic warriors in 267 A.D. to the removal of a large part of the frieze by British diplomat Lord Elgin in early 19th century. The animated segment showed figures clad in black climbing up ladders and destroying part of the Parthenon frieze; the scene referred to well-documented episodes of destruction that took place in the early Byzantine period (5th-8th centuries A.D.), when Christians often demolished monuments and temples belonging to the old pagan era. 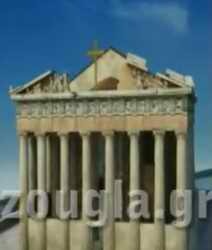 Church officials contended the film misrepresented the attitude of the Greek Orthodox Church toward Greece's ancient heritage. Never underestimate the power of YouTube to leapfrog over a censor's red tape. The latest example involves a battle between Oscar-winning filmmaker Costa-Gavras and the newly opened Acropolis Museum in Greece. Last week, the director asked to withdraw his credit from an animated short that the museum was showing as part of a larger film about the history of the Parthenon. Officials at the museum had reportedly removed a scene from Costa-Gavras' movie after the Greek Orthodox Church objected to what it saw as a depiction of Christian priests destroying parts of the ancient temple. But on Tuesday, the Acropolis Museum said it had reversed its decision to cut the film after days of picketing and the threat of a lawsuit. In the controversial scene, animated figures ascend ladders to destroy the Parthenon frieze. The scene is based on regular occurrences from the Byzantine era, during which Christians would lay waste to pagan temples and structures. A good part of the controversy surrounds what the animated figures are wearing -- some say their black cloaks suggest they represent clergy from the Christian church. Recently, some eager Web surfers posted a version of Costa-Gavras' movie on YouTube so the whole world could see what the fuss was all about. The clip , originally posted by the site zougla.gr, features the offending scene at around the 1-minute 45-second mark.